Camden County Surrogate Michelle Gentek-Mayer celebrates with members of the Craig family. 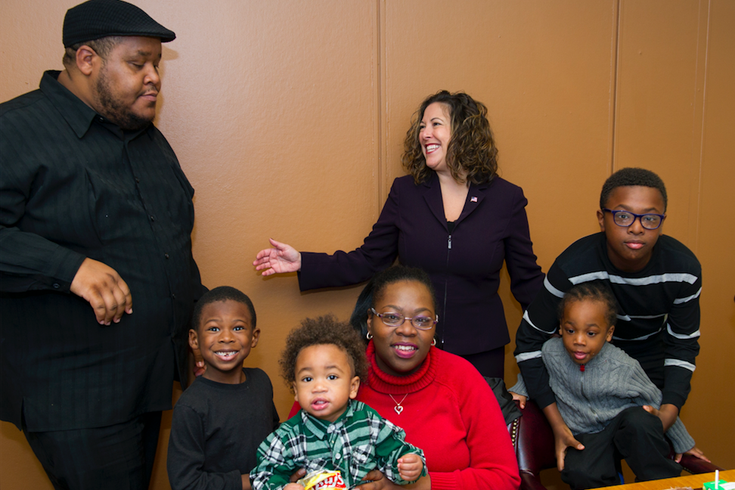 Aminah and Dwayne Craig adopted three brothers – Cyer, Kade and Legend – on National Adoption Day. The joyous noise of three young brothers has filled Aminah and Dwayne Craig's home for nearly 17 months. But on Friday – National Adoption Day – the Lindenwold, Camden County, couple officially gained parental rights to the brothers, adopting Cyer, 4; Kade, 3; and Legend, 1, into their family. The three boys join the Craigs' two biological children – Donell, 15, and Jeremiah, 13 – to make a family of seven. "If you can open your heart to love a child, it's a great thing," Aminah Craig said. "Adoption, to me, is nothing to be embarrassed about. It's nothing to hide. It's the most wonderful thing to be able to choose a child and say, 'I want this child. I want you to come into my home.'" The Camden County Surrogate's Office finalized adoptions for 19 children on Friday, including the three brothers adopted by the Craig family. In any given year, the office processes more than 300 adoptions per year – more than any other office in New Jersey. The adoptions include domestic and international adoptions, plus those facilitated through private agencies and the New Jersey State Department of Children and Families. For the Craig family, it was a lengthy process. At various times, it was sad or frustrating, Aminah Craig said. But ultimately it proved rewarding. Cyer first joined the Craig family as a 13-month-old foster child. But he and Kade shuffled back-and-forth to their biological parents. On June 23, 2017, Cyer, Kade and Legend, then just four weeks old, rejoined the Craig family for good. And it became official on Friday, Adoption Day, a national effort to raise awareness of the more than 100,000 children in foster care looking to be adopted by permanent, loving families. When Cyer heard the judge finalize his adoption, he reacted with excitement, Aminah Craig said. And she nearly teared up. "He's so excited to be with us and we're so excited to have him as our child," Craig said. "It's just been awesome." Though brothers, Craig said each of the children is unique. Cyer is a social butterfly who can "charm his little way into everybody's heart." Kade is bashful, but very affectionate. "Everything is 'Hug me, kiss me – I want to be loved,'" Craig said. "That just melted my heart. He just desires to be loved." And the youngest – Legend – is "a little ball of fire," she said. "He's like a little Tasmanian devil," Craig said. "He's a storm that just comes running into the room, squealing, laughing, running. They each have their own unique quirk or personality about them that make you want to love them." The Craig family first became foster parents to help another family they knew. Once they finished fostering the child, they gave greater thought to taking in more children, discussing the idea with their biological children. "We just came to the conclusion that we're all God's children," Craig said. "There's just so many more out there that need somebody to love them and need a place to go." On Friday, three of them found a permanent home.